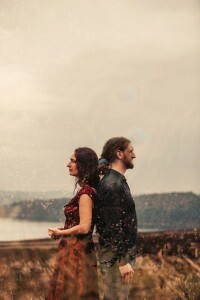 Edgelarks fly in on the tailwind of BBC award winning duo Phillip Henry and Hannah Martin. The new band name comes with a new project, that takes the roots of their previous work, from the traditional musics of the British Isles to Indian classical slide guitar to the stomping roots party of Phil’s beatbox harmonica; adds a strong stem of original writing; and runs wilder with each repeat play. The pair began their musical journey together living in a small caravan in the hills near Exmouth, Devon. They were playing in alt-roots outfit The Roots Union, travelling from festival to festival, tent to tent, wandering the highways, byways, and old forgotten pathways of these islands. They followed in the footsteps of the ancient troubadour tradition, picking up tunes, songs and stories along the way. Spotted busking on the seafront at Sidmouth Folk Festival by champion of independent music Steve Knightley, they soon found themselves touring nationally, supporting the likes of Show of Hands and Seth Lakeman, and eventually winning the prestigious Best Duo award at the 2014 BBC Folk Awards. Edgelarks, which is both their new band name and their fourth studio album, talks about places and people of transition and change. The liminal – borders, crossroads, travellers, refugees, twilight, dawn. The idea that these thresholds, despite often being places of marginalisation, are also places of change – and therefore places of hope. That in the end, we have far more in common that those things that divide us, because we are all liminal – we are all just passing through.